...And with it, the return of peach leaf curl. Peach leaf curl causes leaves of peaches and nectarines to discolor, thicken, pucker, curl, distort and eventually fall off. The fungus overwinters in these trees as spores, usually in the new buds. The rains of late winter and early spring - or in the case of 2012, the above average rainfall of March (and now, April!) - splashed these spores onto the emerging leaves, causing more problems. Emerging shoots can die; fruit production can be reduced in severe infestations. Only rarely do reddish, wrinkled areas develop on fruit surfaces; later in the season these infected areas become corky and tend to crack. The good news is that a second set of leaves soon emerges and can develop normally when the rains cease and daytime temperatures steadily reach into the 80's. The bad news: too many years in a row (perhaps 3) of a serious peach leaf curl infestation can kill peach and nectarine trees. Studies at UC Davis have shown that nipping off infected leaves of peach and nectarine trees doesn't do much good this time of year. If your peach and nectarine trees are showing signs of peach leaf curl now, the best thing you can do is to assist those trees through this stressful period. • Rake up any fallen leaves and pull weeds that are growing beneath the drip line of the trees. • Fertilize the area thoroughly, if you haven't yet done so. • Before the weather heats up into the 90's, spread four inches of fresh organic mulch beneath those fruit trees. Organic mulches, such as compost, shredded branches or the fallen leaves of healthy shrubs and trees will help conserve soil moisture, hold down weeds and add nutrients to the soil as that mulch breaks down. • If a tree is severely affected with peach leaf curl, stunted growth may result; consider thinning fruit later in the season. 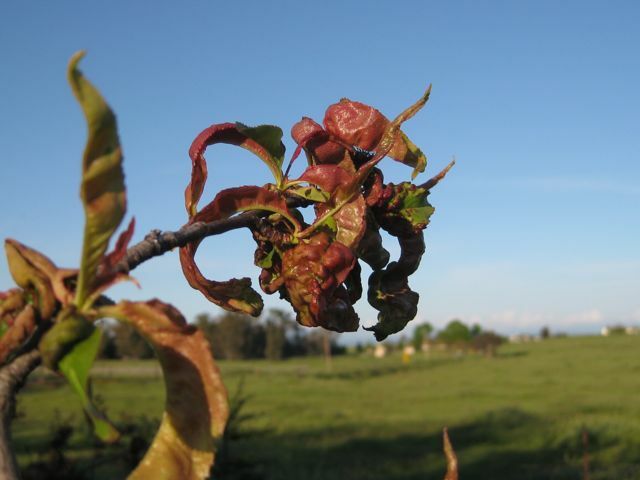 • Pruning in fall prior to applying any fungicides can reduce spore numbers overwintering on the tree and reduce the amount of fungicide needed. 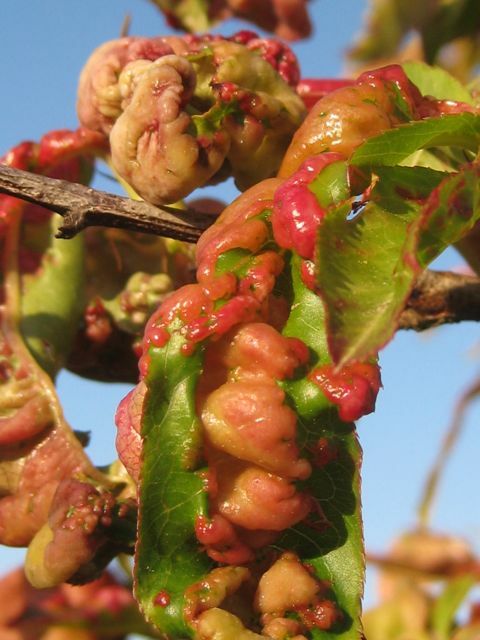 • If leaf curl symptoms occurred on your trees in spring, be sure to treat the following fall and/or winter to prevent more serious losses the following year. The experts at UC Davis advise pruning infected peach trees in the fall before spraying with a copper ammonium complex product with 1% horticultural spray oil added to the mix. In the good old days of fruit tree sprays (2009), 50% copper concentrates were the recommended course of action. Not any more. Copper sprays, such as Liquicop available currently are weaker (about 8% concentration). Lime sulfur has been removed from the market. Bordeaux mixtures are expensive and wasteful...and potentially caustic. And to add insult to injury: recent tests conducted this winter at the Fair Oaks Horticulture Center by Chuck Ingels, UC Farm Advisor, show that the older, stronger copper sprays that are no longer available (Microcop, for example), along with lime sulfur, did provide the best control. The future of peach leaf curl control? "Compared to untreated branches, Liquicop-treated branches averaged about 70% control," says Ingels. "Copper soap was slightly better at 80% control, Agribon (row cover material) by itself was less effective at just under 60% control, and both Agribon + Liquicop and lime sulfur (late fall) followed by Microcop (late winter) resulted in nearly complete control. Maxicrop (sea kelp) did not work at all and seemed to increase the severity on some of the branches." The UC Davis Integrated Pest Management information on controlling peach leaf curl says, "Fixed copper products include tribasic or basic copper sulfate, cupric hydroxide, and copper oxychloride sulfate (C-O-C-S), but currently only liquid products containing copper ammonium complex products with 8% MCE (e.g., Kop R Spray Concentrate [Lilly Miller brands] and Liqui-Cop [Monterey Lawn and Garden]) are available to consumers. The most effective copper product, 90% tribasic copper sulfate with a 50% MCE (Microcop) is no longer available to retail outlets, because the manufacturer withdrew the product in 2010, although remaining supplies still can be sold." One of the reasons for that removal: repeated annual use of copper products over many seasons can result in a buildup of copper in the soil, which eventually can become toxic to soil organisms, and if it moves into waterways, can harm some aquatic species. The removal of lime sulfur products was prompted by a rash of self-inflicted deaths in Japan in 2008 called "Detergent Suicides", which has since spread to the United States. Bordeaux mixtures, a combination of copper sulfate, hydrated lime and water, are effective in controlling peach leaf curl, but come with their own set of warnings. According to the UC IPM Guideline entitled "Bordeaux Mixture": "When applying Bordeaux, be sure to wear protective clothing, including goggles, because the spray deposit is corrosive, can permanently stain clothing, and is difficult to wash off." They also recommend wearing a dust and mist-filtering respirator when mixing in the hydrated lime. And that mixture can discolor anything it touches, including buildings and fences. Although you can purchase pre-packaged Bordeaux Mixtures, they are not as effective as the mixture made from the individual components, reports that UC IPM Guideline. And that brings up the cost and waste involved: copper sulfate and hydrated lime are usually sold in large quantities, much more than the average homeowner needs for the backyard peach and nectarine trees. Storage involves mixing the leftover individual ingredients separately in water and storing in their own sealed jars. That UC IPM Bordeaux Mixture Guideline warns: "Be sure to clearly label both stock solutions and store them where children can’t get into them, since these materials, especially the copper sulfate, are very toxic and corrosive." 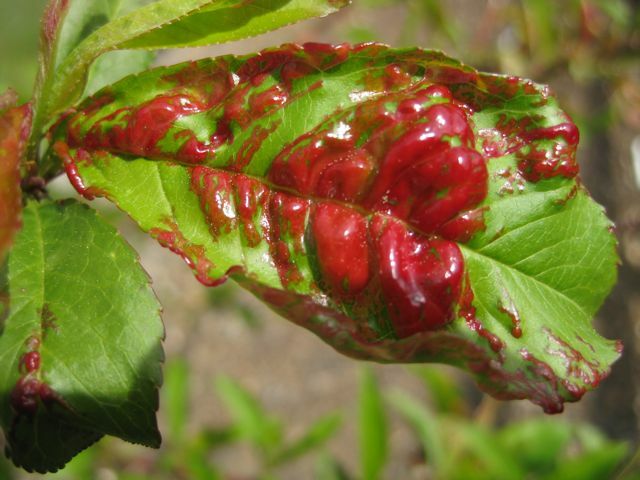 The synthetic fungicide chlorothalonil is the only non-copper fungicide available for managing peach leaf curl in the backyard orchard. 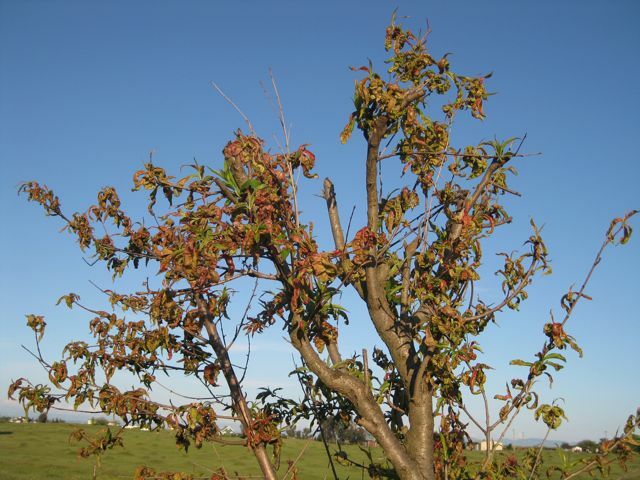 Although one fall application may help prevent a spring outbreak of peach leaf curl, a second application in January or February, as the buds begin to swell, can be beneficial, as well. "This product is toxic to aquatic invertebrates and wildlife. Do not apply directly to water or to areas where surface water is present or to intertidal areas below the mean high water mark. Drift and runoff from treated areas may be hazardous to aquatic organisms in neighboring areas." Or this: "May be fatal if inhaled. Harmful if swallowed or absorbed through skin. Causes moderate eye irritation. Avoid contact with eyes, skin or clothing. Do not breathe spray mist. chemical known to the State of California to cause cancer." No matter which spray method you choose, several days of dry weather must follow for the products to work. And that was the frustrating part of the winter of 2011-2012: the weather was comparatively dry during December, January and February...perfect for spray applications. The wet March (and now April) was the perfect vector for peach leaf curl, splashing spores of the disease to those branches that were unsprayed or incompletely sprayed. There are peach varieties that are more resistant to peach leaf curl. The downside: they may not be as flavorful as you might like. Peach varieties reported to be more leaf curl resistant include Frost, Indian Free, Q-1-8 and Muir; among nectarines, only the Kreibich variety is resistant, says UC Davis. 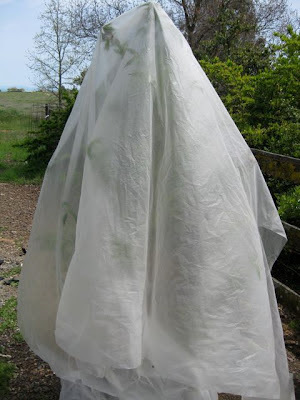 And for those who want to provide a helping hand next fall and winter to their suffering peach and nectarine trees: there's always spraying Liquicop combined with a spreader-sticker, followed by covering the trees with a row cover such as Agribon or other row cover fabric during rainy weather. Be sure to remove any covers during sunny weather to avoid overheating problems. And it might not hurt to cover your peach trees during a rainy April, too. You stated that sea kelp was not effective and could make matters worse, but I have used Norwegian Sea Weed Extract very effectively for years and recommend it to customers and gotten good feed back. We even use it in the nursery, not as a preventative, but to treat after we get peach leaf curl. It seems to make the leaves fall off faster and new foliage grows out without the curl. I always recommend doing a foliar spray and water the tree in with it. Too bad they take the good stuff off the market. Send some rain out east here...............6.5 inches below normal rainfall, really warm March and no snowfall this winter. Copper soap worked better than Liquicop! That's good news for organic gardeners. Glad to see Chuck's results finally.